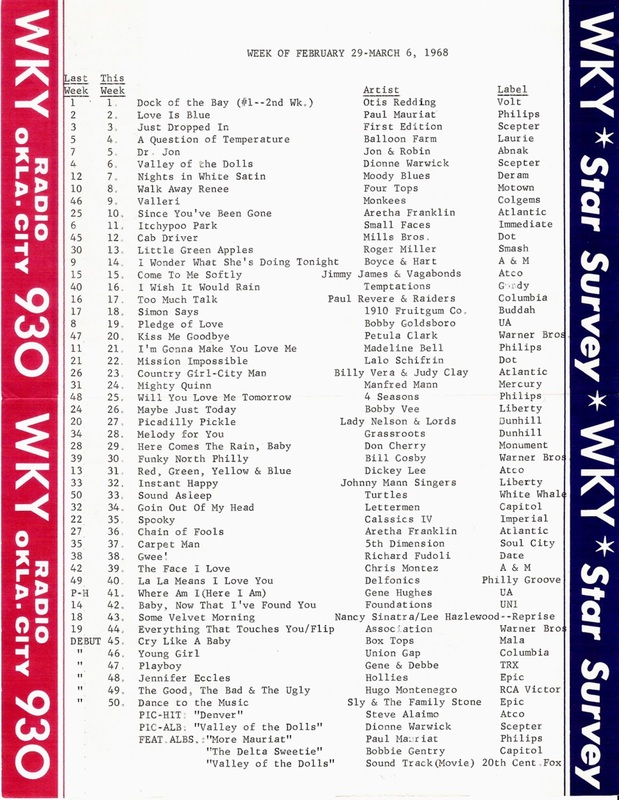 Here in Oklahoma City, Otis Redding's "Dock Of The Bay" holds at #1 for a second week ... and check out The Monkees ... still mega-hot as their latest, "Valleri," (also a song first recorded for their TV show in 1967) sky-rockets from #46 to #9!!! Actually, there are quite a few big movers on this week's chart ... "Cab Driver" by The Mills Brothers climbs from #45 to #12, Petula Clark is up 27 places (from #47 to #20) with her latest, "Kiss Me Goodbye," Aretha Franklin's "Since You've Been Gone" now sits at #10 (up from #25 the week before) as "Chain Of Fools is still making its way down the chart at #36. It looks like its Roger Miller's version of "Little Green Apples" that's the big hit in Oklahoma City (up from #30 to #13 ... O.C. 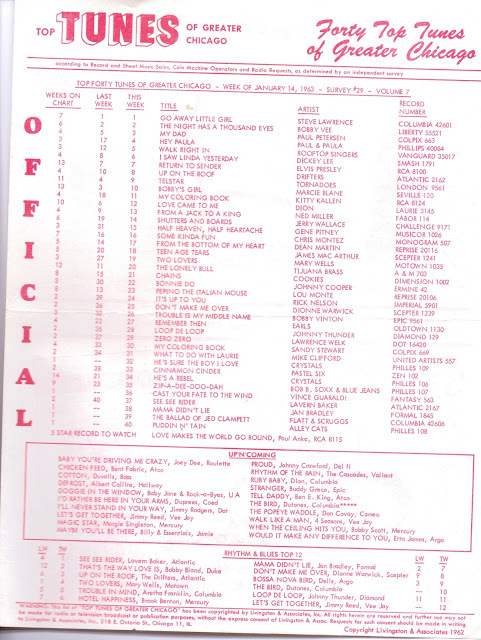 Smith will have the bigger national chart hit about six months from now), The Temptations jump 24 places (from #40 to #16) with their latest, "I Wish It Would Rain," The Four Seasons climb from #48 to #25 with their version of "Will You Love Me Tomorrow" and it looks like The Turtles have another smash on their hands as "Sound Asleep" climbs from #50 to #33. 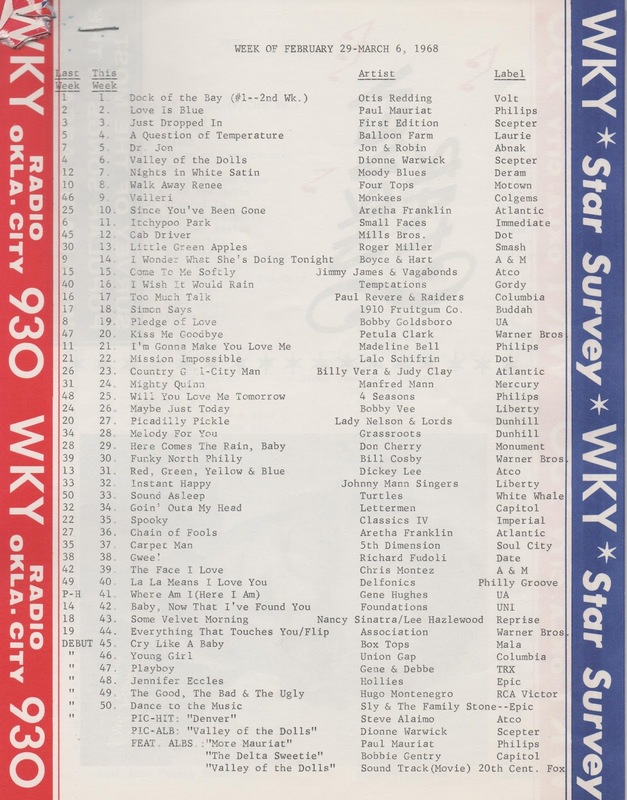 Although Oklahoma City's KOMA was the Midwest Top 40 juggernaut that can be compared to the top stations of the 60's, it was town rival WKY that often led the top 40 ratings book in OKC itself. Both stations created an atmosphere of a WLS / WCFL battle that was great for we listeners in those golden years. This one was just too good to pass up as our buddies The Buckinghams top the chart in Boston with their psychedelic pop sound of "Susan," still one of my all-time favorites from these guys. The Bucks are in at least their second week on top of the chart, which is showing some pretty big chart discrepancies from the WKY chart above it, considering this is exactly the same week. Thanks for sending. Boston and the East coast were great to us. We toured quite a bit up and down the eastern seaboard, especially NY and Boston. 2/29/68: The Beatles’ “Sgt. Pepper’s Lonely Hearts Club Band” wins the Grammy for Best Album of the Year. (It also wins awards for George Martin as Producer, Geoff Emerick for engineering, and Best Album Cover Graphics for Peter Blake and Jann Haworth. Aretha Franklin wins her first Grammy that same night, for Best Female R&B Vocal for last year’s #1 Hit “Respect” ... and the future looks bright for Bobbie Gentry, too, who wins awards for Best New Artist and Best Female Vocal Performance for her groundbreaking "Ode To Billie Joe." "Up, Up And Away" by The Fifth Dimension wins multiple awards for the group, the producer (Johnny Rivers) and the writer (Jimmy Webb) and Glen Campbell scores a couple for "By The Time I Get To Phoenix." 3/1/68: Elton John's first record, "I've Been Loving You Too Long," is released in The UK on the Philips Record Label. It bombs ... and they drop him a year later when his contract is up. 3/2/68: Cat Stevens is hospitalized with tuberculosis ... he'll spend the next few months recuperating. Yikes! It's Portuguese, not Spanish! In your review of Sergio Mendes' show, you said he sang a few songs in Spanish. I always thought, since his group is Brasil '66, that his other language was Portuguese, the language of Brazil, but in all these years, I never verified it. Could you please verify the other language? I read your updates every day ... keep 'em comin'. Radio. It's a sound idea! Thanks so much for the review of the 'Sergio Mendez concert". What a time it was when Herb Alpert and his Tijuana Brass and Sergio and Brasil ’66 brought on their special sound of music. It brought back memories when WCFL Top 40 sheets featured fans and where they bought their records. I was one who was chosen with my photo on the sheet saying " I buy my records at "The Cermak Plaza Record Shop"!! And as a prize, I got a copy of Herb Alpert's "Lonely Bull" Album!!! What a thrill! 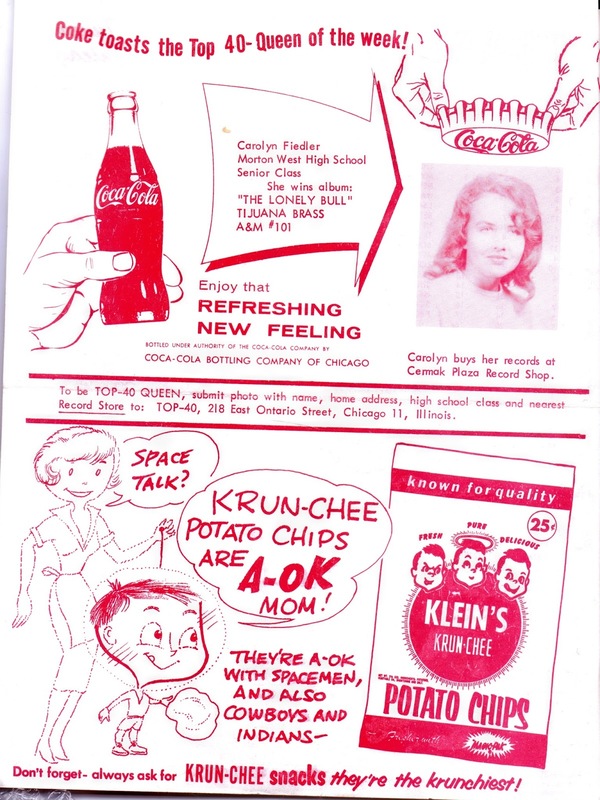 My maiden name is Fiedler (pronounced feedler) and it was from my senior year in 1963. Good Grief, where does the time go??!! I may have a copy but it would take me awhile to try and locate it. I am a pack rat at heart. Thanks for sharing your review of the Sergio Mendes concert. I was out of town. Would have loved to be there. Let me know if he’s coming back. Wonderful piece on Sergio Mendes. As we have discussed over the years, the name of the game is to be in it for 50 years, not 15 minutes. In 1966 and '67 I saw Herb Alpert and the Tijuana Brass and one of the early concerts by Brazil '66 at Fairfax High School in West Hollywood at our school's gymnasium. Herb's gig was a benefit for earthquake relief in Mexico. Herb, a Fairfax High alum, had close ties with our 1964 - 1970 principal, James Tunney, who was also an NFL referee and official who worked a slew of Super Bowls. As a Child of Hollywood, I still am, my books and writing underscore this ongoing reality, those two concerts steered me further to the discovery of other A&M Records recording artists like Chris Montez, the Sandpipers, Burt Bacharach, and the Baja Marimba Band with Julius Wechter, the marimba player with the Tijuana Brass. In the process I became aware of arranger David Angel who in 1967 worked on Love's "Forever Changes" with the influential engineer / producer Bruce Botnick. These seminal records pointed me to jazz stations like KBCA-FM in Los Angeles. I await the long form documentary currently being produced on Sergio's fascinating career. In 2014, I interviewed the legendary engineer / producer Bones Howe for my book "Turn Up The Radio! Rock, Pop, and Roll in Los Angeles 1956 - 1972." Bones offered some stellar comments about AM radio in 1966 and Sergio Mendes and the recording session of "Mas Que Nada" that you and your readers might enjoy. BONES HOWE: The radio world in L.A. was the Wild West. Everybody was after everybody else’s ratings. Believe me … It was like a baseball game, and KHJ wanted to crush KRLA. One of the ideas behind KHJ was that the music keeps coming. So, except for the little short commercial breaks, they butted those records one up against the other, and talked over the intros and did promos over intros. Which is why you got to hear an extra song or two per hour, and a lot of good stuff. [Deejay] Real Don Steele’s talk and intros were like pieces unto themselves. I’d tune in just to hear them! I met Bill Drake, who programmed the RKO chain and consulted on the playlist. He had been a disc jockey and loved being a DJ, but his thing was that he analyzed format. He was the guy who understood that format had a big effect upon the listening audience. He engineered that Boss Radio format, where the music was going all the time and the commercials were snuck in. You can’t make good rock ’n’ roll records if you don’t listen to the radio, and I listened to the radio all the time when I wasn’t in the studio. The one wonderful experience is when you’ve heard your own record on the radio, and you know what you’ve done and hear what it sounds like. But, of course, by the time I was doing that, I had done records for Lou Adler and others and heard them on the radio. I knew what to do to make a record sound good on the radio. So that was a key. Let me tell you what my audience is. It’s four girls in a Volkswagen Bug, listening to the music in a six-by-nine oval speaker in their car, going sixty miles an hour on the freeways. That’s what it’s about. Not about great speakers and hi-fi. Your audience was fourteen - to eighteen - year-old girls, mostly. They were the ones who bought the records. None of us really knew the how much influence the transistor radio was gonna have. The transistor radio was for the ball games. Studio guys had the thing in their pocket and an earphone; while they were recording, [they] were really listening to the Dodger game. What you had to do was listen to the radio and know what your records were gonna sound like when they got played. That’s how people went and bought them. I loved that session. The percussion elements — those were real players, not studio players. The difference between them playing “The Joker” and then, when they got cut loose, “Mas Que Nada” ... it was completely different, and just wonderful. It had so much energy. It carried the other side. Jerry [Moss] was a terrific promotion man. He took the “The Joker” record out and played it to a DJ, who said to him, “What’s on the other side?” He spun it. “We’ll put that on the radio.” Can you imagine? The wonderful thing, later, about FM was that it was much truer to the studio mix than it was on KHJ, coming out of little car radios and all the rest of that. Because it was very squelched, very limited on AM." The lead singer of one of my favorite vocal groups of all-time died today (Thursday). Bill Burkette, the original lead singer of the Vogues, had been fighting cancer. The band never received the industry recognition they deserved for the many hits they delivered. I’m so happy in recent years PBS-TV featured Bill and the Vogues on one of their music specials, so a lot of fans got to see them for the first time in years and the harmonies were still right on the money. Their TV version on PBS of “Turn Around Look At Me” was note for note as good as the original late 60s version. Here an article for Bill’s hometown newspaper. THE PBS performance was nothing short of stunning. Check out all these Snoopy-related goings on at The Elmhurst History Museum over the next couple of months!!! Snoopy and friends will be marching in the Elmhurst St. Pat's Parade on March 10. Keep an eye out for his special dog house, hand-crafted by Elmhurst Heritage Foundation board member Mike LoCicero. See you on March 10! We're excited to partner with Elmhurst City Centre and York Theatre to bring the 2015 Peanuts Movie to the big screen for a FREE showing. Snoopy will be on hand after the movie in City Centre Plaza for photo ops and other fun activities. I was kind of waiting to see what kind of response you were going to get on this, but so far it seems very little. Actually at one point I had half a page devoted to my #1 over rated act, but I deleted it. Didn't feel like going into an extended rant. Besides I'm gonna catch enough grief for this list, so here goes. #10 Garth Brooks - I'm not sure if he should be idolized for putting a rock and roll mentality into country, or be lionized for it. To quote Mr. Kotal, I don't see it. #9 ZZ Top - Almost 50 years of playing the same exact melody. #8 Eric Clapton - Eric is about as much of a blues performer as I am. #7 Journey - They were nothing before Steve Perry, nothing afterwards. A decent enough chart performance history, but you'd think based on airplay, that they were a massive hit making machine. They really weren't. #6 Lynyrd Skynyrd - It's amazing what death by Rock And Roll can do for your career. #5 Billy Joel - Had HE died in a plane crash, after Piano Man, he'd be a legend. #4 Led Zeppelin - A band that never heard a blues song they didn't rip off. See #8 above. #3 Pink Floyd - Still another band you would have thought was a hit making machine. They were interesting while Syd was in the group. #2 Chicago - If I wanted to hear jazz, I'll listen to the real thing, not the watered down stuff these guys put out. Moreover, they haven't recorded anything interesting in over 40 years. Should have called it quits after Terry Kath died. #1 The Beatles - Payola is a beautiful thing. However, it's possible without them, we might have not have heard of bands who did provide us with some interesting music. Rock and Roll’s not always pretty … and here’s a perfect (and pretty powerful) example. The fight between all of his “wives” over the royalty money that would be coming in after Diana Ross cut a cover of his biggest hit is entertaining as hell. NOTE: A second show has just been added for March 24th! I'm not quite sure how doo-wop purists are going to feel about this one but PBS is airing another one of their infamous TJ Lubinsky / "My Music" pledge-drive concerts tomorrow night. The concept is simple enough ... vintage doo wop acts performing with modern day artists to help more of this great music to cross over to a new generation. "The Angels Listened In" – JT Carter's Group with Peter Lemongello, Jr. Check your local listings for PBS airings in your area. Thanks for the mention on the new Flock release. Maybe now I can once-again be semi-famous. Have you heard about this death. ? Barbara Alston, founder and lead singer of the Crystals on the hits "Uptown" (#12 - 1962) and "There's No Other (Like My Baby)" (#20 - 1962), died February 16 after suffering complications from influenza at a hospital in Charlotte, North Carolina. She was 74. The Brooklyn quartet were an integral part of producer Phil Spector's "Wall of Sound" -- though not integral enough to keep him from using Darlene Love and the Blossoms on subsequent "Crystals" records, "He's A Rebel" and "He's Sure The Boy I Love". La La Brooks then replaced Barbara as lead on later hits. After leaving the Crystals, Barbara became an actress, appearing on television in "Kojak" and "Hill Street Blues". Hooray, I found it! Sister Theresa's Orphanage was early on, kinda during the Folksie era, on Verve. A better example of their Happy Hour songs are Cloud Nine Motel and My Eggs Don't Taste The Same Without You. One of two songs I sent you was loved by me but maybe you really had to experience it. If you google Kings of Cape Cod or Fabulous Farquahr, some joyous stuff comes up. Thousands of New England college kids enjoyed them late 1960's right up until the late 1990's. Dan McCarthy is the producer of a documentary called "Kings of Cape Cod," the story of the phenomenon that was the "scene" on Cape Cod from the 60's through the 90's. The coming together of college kids released from the ties of parental control, combined with relatively cheap beer, the magnificence of Cape Cod's beaches and their coming of age partying to the tunes of the Guitar Players at Happy Hours will never be replicated. At the end of today's FH, you mentioned you were going to be spotlighting surveys of Oklahoma this week. #5,13,15,19, 27, 29, 31, 32, 38 (who remembers this one? ), 41, and the PIC HIT. 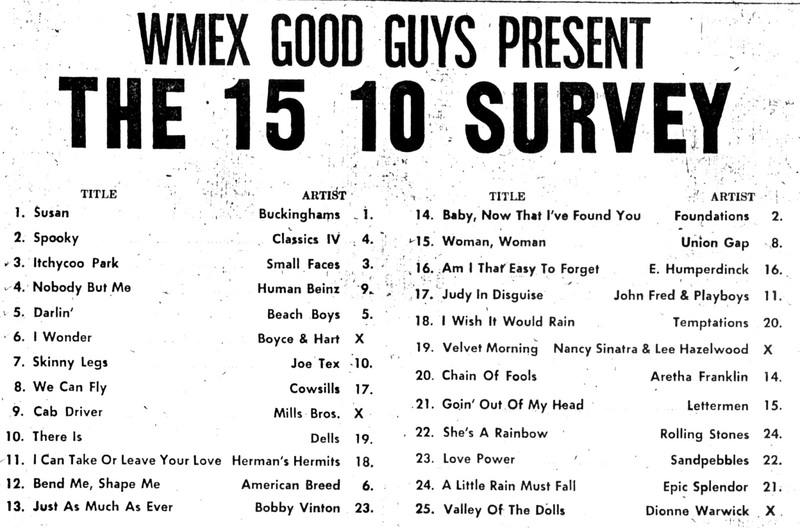 These are records in my opinion that probably didn't make most of the other surveys out at the time. March 2, 2018 --- Scott Shannon's 4th Anniversary at WCBS - FM. Scott said he knew about Alan Freed and New York Radio … had no idea how he would make it from Indiana to New York. He must've figured it out, cause he's here.